On November 26, 1965 Joseph Beuys performed How to Explain Pictures to a Dead Hare in Gallerie Schmela in Dusseldorf Germany. In honor of the 50th anniversary of the work we dedicate a moment to note the differences between rabbits and hares and the implications for Mr. Beuys. Both rabbit and hare are of the Leporidae family, but separate into a number of different genus and species. 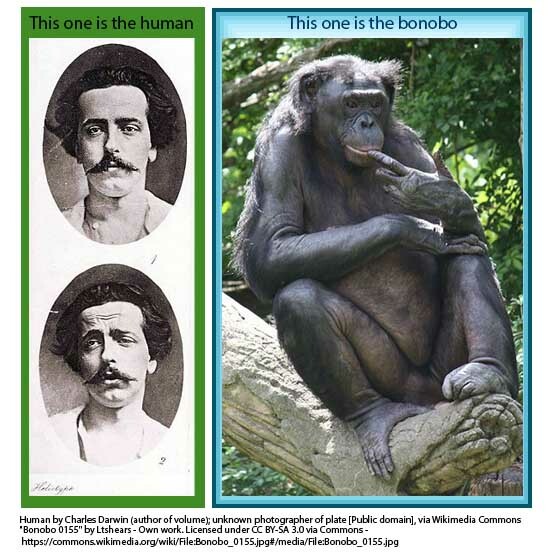 To equate them is like equating all Hominidae genus and species, that is to say a human and a bonobo are identical. In fact, the rabbit has 44 chromosomes to the hare’s 48. Rabbits are born blind and hairless whereas hares are born with their fur, eyes open and ready to run. Unlike rabbits, hares never burrow so they need this ability to weather the elements from their first moment. 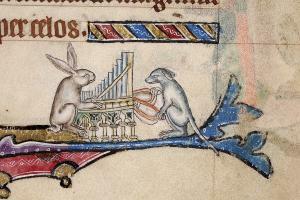 Hare playing a pipe organ in the Macclesfield Psalter, circa 1330. Rabbits may get all of the attention in the children’s book market but hares dominate fine art well before Beuys. Simon Carnell, author of Hare delves into the ways that hares far outpace rabbits both in physical speed and cleverness and boast a more complex relationship to humans in terms of the imaginings of mythology and the misguided pseudoscience of the early naturalists. 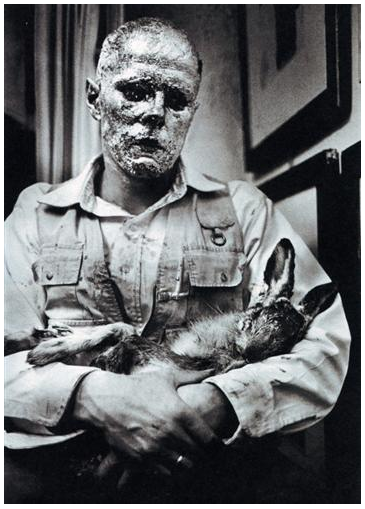 Carnell examines Beuys’ use of the hare as imagery and material, subject and symbol. Beuys places significance on the hare’s habit of burrowing, describing this as an act of resurrection when in truth, this habit is exclusive to rabbits. So why not the rabbit for Joseph Beuys? Carnell indicates that Beuys may have known that hare was a slang term for children in the Warsaw ghetto, and that images of hare hunting stood in for persecution of the Jewish people. Beuys did not acknowledge this linguistic tie between the hare and the Holocaust, but it would explain the willful oversight of an easily observed habit of an animal with whom he spent untold hours of his adult life. On Germany’s Club 2 television roundtable Beuys asserted that the hare comes out of all experiences of his life. Those experiences include membership in the Hitler Youth and active service in the German army followed by the shock of discovering the atrocities of the Nazi party. Although his account has been called apocryphal, Beuys’ willingness to obfuscate the distinction between these two animals applies one more layer of intrigue to his emotionally powerful and historically significant work. By Tania O’Donnell: to read more about Tania click on our contributors page. Tags: hare, Joseph Beuys, rabbit, Tania O'Donnell. Bookmark the permalink.